First time posting art here. Some fakemon ideas. 4 Weeks Ago (12:39 AM). There's this theory that's been going around for a while that the Fire-type starters are being drawn from the Chinese zodiac (Monkey, Rooster, Pig, Dragon, etc). I'm not really invested in whether or not it's true, but it HAS inspired me to come up with some possible designs. 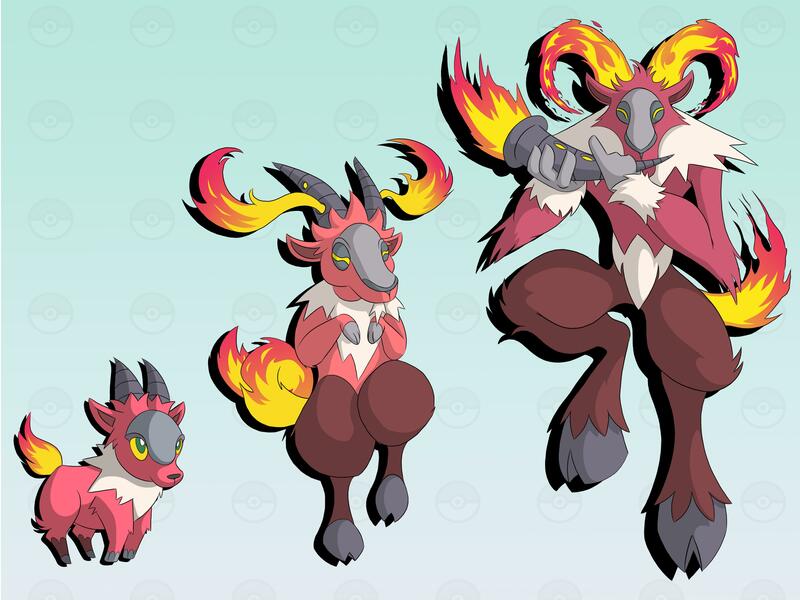 This is my concept for a fire starter line based on one of the missing zodiac animals - the goat. I took this concept a bit further as it evolves, eventually incorporating ideas and themes from mythology, specifically Satyrs. Description: While its horns are powerful, they are actually hollow inside. The interior of these horns burn like a furnace and release heat, which not only help regulate its body temperature, but can burn opponents at the touch. While fighting, Baablaze will prance around the battlefield, making it surprisingly elusive. Description: The heat generated in its horns becomes so intense, that flames begin to burst through and create small holes. Males attract females by expelling flames through these holes to give their horns bigger, and more intricate designs. This Pokemon is always hopping from one foot to the other, as if it's dancing to some unheard music. Description: Upon reaching adulthood, the horns that once encased its flames can no longer contain them, and eventually fall off. This crafty Pokemon can breathe fire through the discarded horns like a flute, which creates bizarre melodies that no man-made instrument can duplicate. These songs seem to have whimsical effects on those who hear them, and can cause anything from spontaneous dancing to mass hysteria. Effect: The user plays a tune using a horn flute that inspires all Pokemon on the field to dance, giving them the Dancer ability. Effect: Effects of opponent's dance moves are reversed. Swords Dance, Dragon Dance, and Quiver Dance will lower the user's stats instead of raising. Feather Dance will raise the target's Attack instead of lowering. Teeter Dance will heal confusion instead of inflicting it. Fiery Dance has a 50% chance of lowering the user's Sp.Atk instead of raising. Lunar Dance will fully heal the user instead of causing them to faint. Petal Dance will snap the user out of confusion instead of causing it. The idea behind Satyrsire's gimmick is that it can apply the Dancer ability to all Pokemon on the field with its signature move, Magical Horn. Then, it may use moves like Swords Dance or Dragon Dance, and the opponents will be forced to copy these moves because of Dancer. However, because of Satyrsire's Hidden Ability, Dancing Panic, the effects of those moves are reversed when used by opponents, effectively lowering their stats while simultaneously raising its own. 4 Weeks Ago (2:54 AM). This is actually super creative and I love the creativity behind the dancing satyr gimmick you've got going here. Amazing fakemon! Keep it up! 4 Weeks Ago (6:15 AM).